A lot of cities will all have the same chain restaurants and shops, and Swansea is no different. But if you want to see something a little different, Swansea also has a number of independent restaurants and boutique shops. Christmas is on the horizon – it always is – but have you started your present shopping yet? If you’re looking for a personalised and bespoke item, then pay a visit to Cherish in Wales’ largest indoor market. Cherish creates and stocks a large variety of handcrafted gifts, from silver jewellery to wooden hanging signs. If you are spending a few days staying in a Swansea hotel this winter, make sure to pay this small store a visit. If you are after a classy affair, book a table in this Welsh favourite in the Swansea suburbs. Slice is small and compact with only 18 covers available at one time, and its superb homely food means people are fighting over seats. All the food here is prepared by a master chef duo, who are bringing some modern flair to traditional Welsh cuisine. The gourmet cuisine here has won a certificate of excellence from TripAdvisor, and the restaurant ranks as the second best in the whole of Swansea. If you are engaged then you just have to pay a visit to Jorja Janae Bridal. This chic boutique is a bride-to-be’s dream with elegant dresses lining the walls and personal, quality service. Choosing your wedding dress is an important part of your wedding preparation, after all, you only get married once (hopefully). And this family-run business will take the stress out of your big day, by finding you something you feel amazing in. Are you a bit of a nerd? Then you’ll love Comix Shoppe. The store has been selling graphic novels and comics since 1986 and has seen much success as one of the best comic stores in South Wales. So whether you are a Dr Who fan or you prefer Sonic Boom, you are sure to find something to read you just can’t put down. For that perfect party dress for the Christmas night out with work, or that New Year’s Eve celebration, pay a visit to Arora Boutique. They stock hundreds of dresses, long and short, for all occasions, at affordable prices. You are bound to find that dream dress in this store. After a long weekend staying in Swansea, you may like to take a gift back home for your loved ones. We think a love spoon would make the perfect gift for a partner, to show off your romantic side. And these specialists offer one of the largest collections of designs in Wales. You could even commission a piece! The Lovespoon Gallery has been an integral part of the Mumbles community since 1987, and no trip here is complete without taking a look around this small store. Post by The front room. What do you use your front room for? As a lounge for the evenings, a playroom for the kids or maybe entertaining? Well, this front room is a café. Relaxing and comfortable with plenty of squishy sofas and sturdy armchairs, The Front Room on Mumbles seafront is a handy location for home cooked comfort food and winter warmers. This is a child friendly café with a ‘Munchkins menu’ of smaller meals, as well as plenty of toys and crayons for colouring. So if you are travelling to Swansea with the entire family, this is a great pit stop to make. 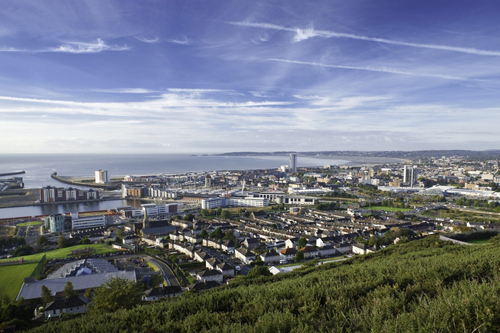 The next time you are wondering what to do in Swansea consult this list! We’re sure you won’t be disappointed. If you are thinking about visiting South Wales, take a look at the accommodation at Swansea’s Dragon Hotel. With modern and affordable rooms, in a central location, you can’t go wrong. Get in contact with the Dragon Hotel today!